NOTE: Colored and underlined text indicates new features only available in the next release of the application currently under review on the iPhone App Store – some of the screen shots might also reflect the new version and be slightly different from the version currently available for download. Access the list of previously saved and scheduled recordings – including details for each item. 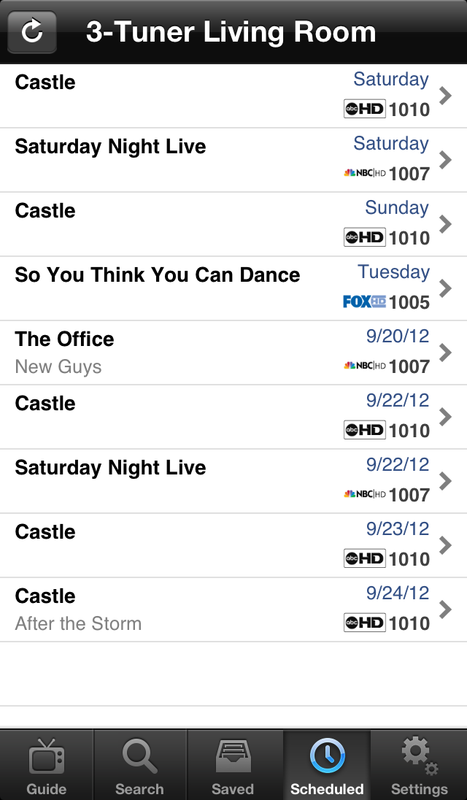 Access channel guide data for up to 12 days ahead and schedule recording for any show from the guide. Search shows/movies by title and schedule recording directly from the search results. Define favorite channels for quick access in the guide view and disable channels to hide them from the guide and search results - share lineup settings between different devices running the application via email. Immediate feedback to confirm that scheduling changes have been saved to your device or the application will notify you of any scheduling conflicts. Change options for scheduled recordings (cancel recording or record series). Delete saved recordings from your device. Read and delete service messages for all your devices from within the application. MOXI Remote stores your account password securely in your device's keychain for faster login when launching the application – communication is done via secure connections (SSL) to the MOXI servers. MOXI Remote is available on the US iPhone App Store (requires iPhone 5.0 Software Update or higher and at least one existing MOXI HD DVR connected to your online MOXI user account). NOTE: MOXI Remote does only work for retail MOXI DVRs, it does not work with MOXI DVRs provided by your cable company. • The "Messages" section shows the number of service messages for all your devices – select to read all the messages (section will only appear if at least one service messages is available). Swipe to delete any message in the message list (note that only device-specific messages can be deleted). 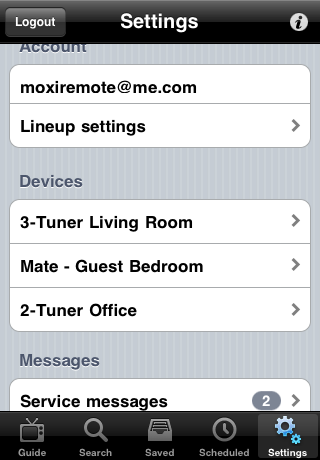 • Tap the device name title to share your current lineup settings (favorites and enabled channels) - settings can be directly copied to your other devices using the same cable provider or shared via email to other devices running the MOXI Remote application. • Rather than selecting between the different views using tabs at the bottom as on the iPhone, the iPad version shows a list of possible views on the left to provide a better application flow - all interactions in the individual views (e.g., device selection) are identical to the iPhone version. • Recording details are shown in a popover view rather than a separate window (as seen in the screen shot). • On the iPad, the application works in any direction (landscape or portrait). 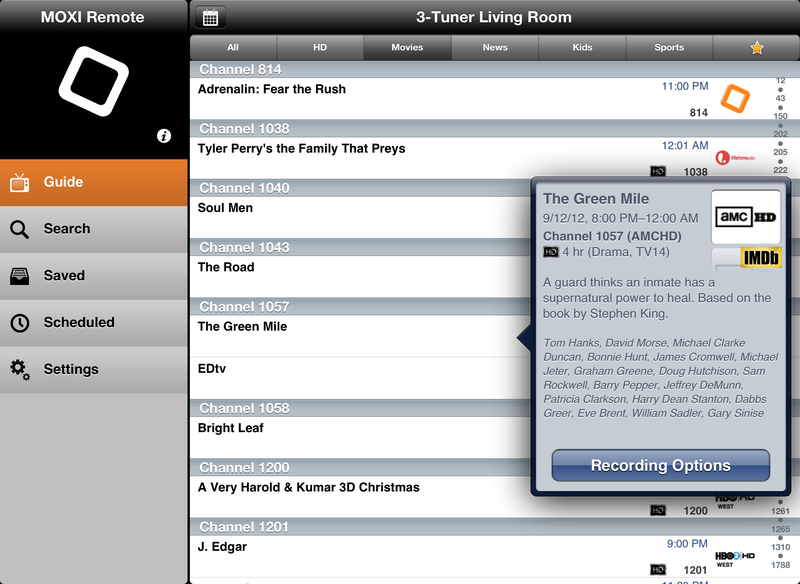 Recordings that were already saved on your DVR when the application was first used will not show any details as they are only available for scheduled or ongoing recordings. Details for recordings that at one time have been seen as scheduled or ongoing by the application will be preserved once the recording has been saved. There are two kind of service messages – device-specific (which will include the device name in the message title) and system-wide messages. While the application will display both kinds of messages, only device-specific messages can be deleted; system-wide messages will automatically disappear once they expire. 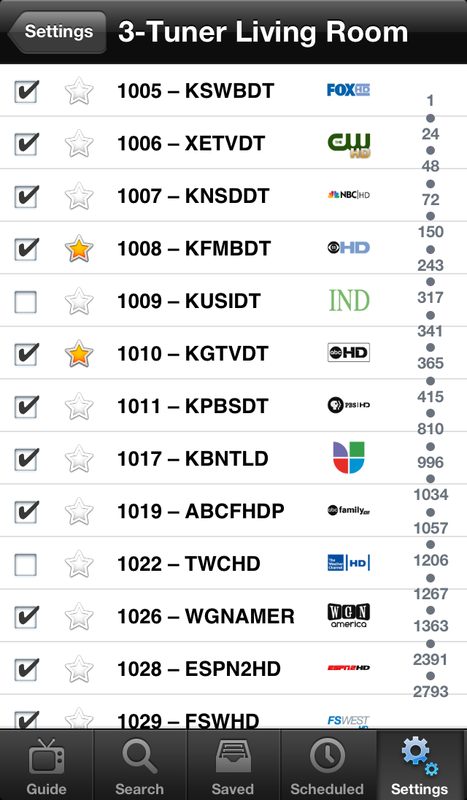 In order not to clutter up the interface, channels that don't allow recording (e.g., video on demand, radio channels) are not shown in the application. Fix missing "Recording Options" for search results when running on an iPad. 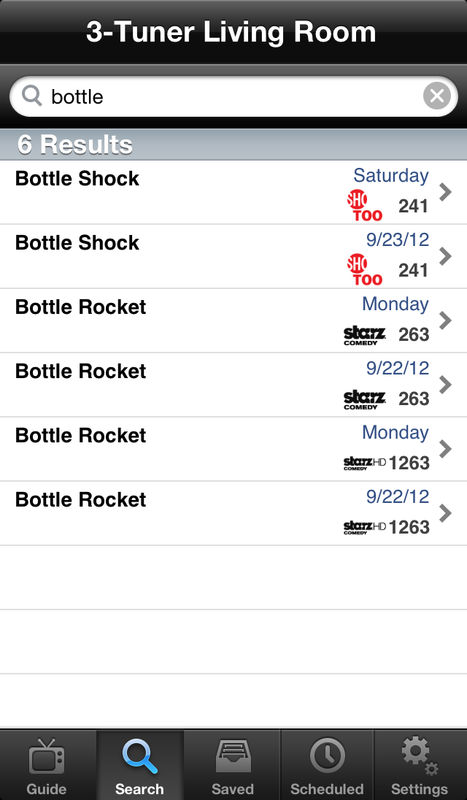 Application is now universal and includes an optimized version for both, iPhone/iPod Touch and iPad. Show a badge with the number of new unread service messages on the Settings tab/cell. Improved handling of renamed/removed channels from the settings list. Fixed various minor UI glitches. Shows that are broadcast in high definition are now marked with an "HD" icon in the guide and in the show details (when accessed from the guide). Shows that are scheduled to be recorded or are currently being recorded are now marked as such in the guide and search results. Scheduled or ongoing shows can now be cancelled from the guide or search results as well. Allow switching to a different tab while performing a search. Better use of available space and truncation for recording titles in lists. Various performance optimizations to speed up parsing of data - the biggest improvement pertains to updating the guide data. Performance improvements for drawing recording lists - show titles no longer go back and forth between one-line and two-line display for the same recording. Reduced memory footprint while running and when suspended in background. Honor changed date format system preference settings immediately when returning from background. Allow sharing of lineup setting (enabled and favorite channels) to synchronize settings between devices - tap the device name in the channel list view title to share the device's lineup settings via email. Enable deletion of individual episodes from a recorded series when currently being located in a different time zone than the MOXI device. Various improvements related to backgrounding in iOS 4 - this should resolve issues with sessions expiring and make sure that information is automatically updated when returning from background. Fix issue where some recordings would be missing (e.g., for identical shows shown on the same channel at multiple times). Fix issue where some recordings would not display their title if they contained non-ASCII characters. Added support for iOS 4. Added high resolution graphics for the iPhone 4. Allow deletion of saved recordings. 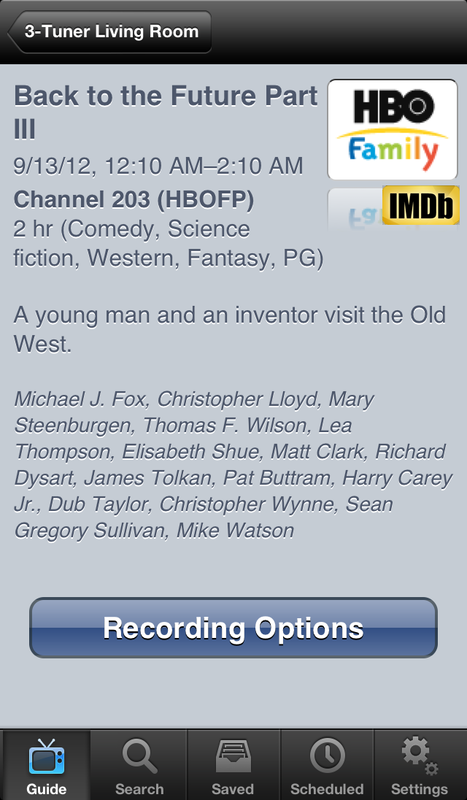 Use two lines for shows in the list views for recordings with long titles but without an episode title. 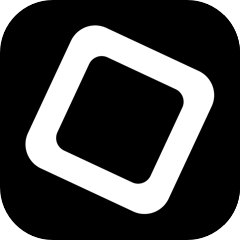 MOXI is a trademark owned by ARRIS Group, Inc. – MOXI Remote is not affiliated with or endorsed by ARRIS Group, Inc.